The Supreme Court and the Development of Law Smith Christopher E.
Add to cart the imprimé à la demande of Smith Christopher E.
This book illuminates the decision-making processes of the US Supreme court through an examination of several prisoners' rights cases. In 1964, the Supreme Court declined to hear prisoners? claims about religious freedom. In 2014, the Supreme Court heard a case that led to the justices? unanimous endorsement of a Muslim prisoner?s religious right to grow a beard despite objections from prison officials. In the fifty-year span between those two events, the Supreme Court developed the law concerning rights for imprisoned offenders. 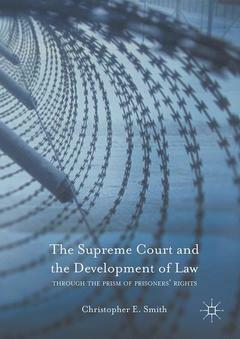 As demonstrated in this book, the factors that shape Supreme Court decision making are well-illustrated by prisoners? rights cases. This area of law illuminates competing approaches to constitutional interpretation, behind-the-scenes interactions among the justices, and the manipulation of legal precedents. External actors also affect the Supreme Court and its decisions when the president appoints new justices and Congress targets the judiciary with legislative enactments. Because of the controversial nature of prisoners? rights issues, these cases serve to illuminate the full array of influences over Supreme Court decision making. Christopher E. Smith is Professor of Criminal Justice at Michigan State University, USA. He is the author of more than 20 books, including Constitutional Rights: Myths & Realities, Law and Contemporary Corrections, Courts and the Poor, and John Paul Stevens: Defender of Rights in Criminal Justice.